Welcome back to another episode of The Twister, a quiz with a twist. We find some random object on eBay/craigslist/eHarmony and you get to figure out how to make it better. 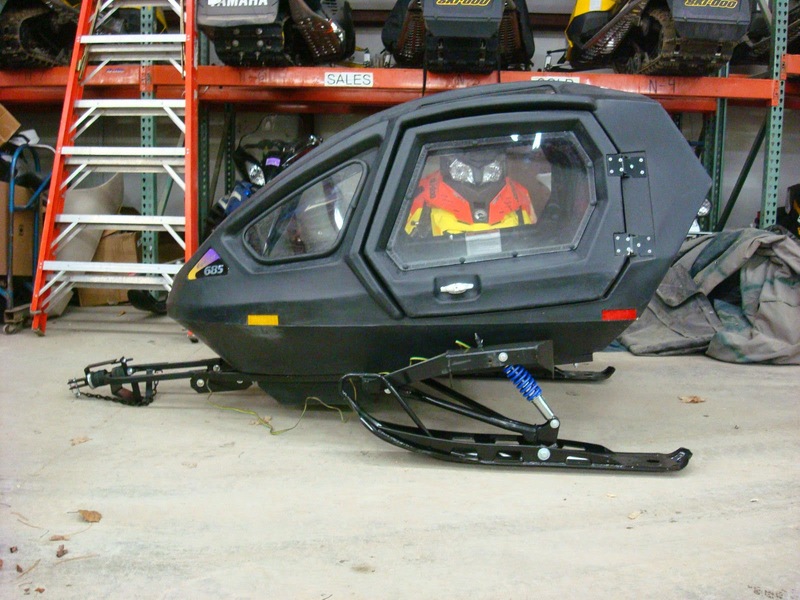 Today's twister subject is a used Snowcoach by Quinox found here on eBay for $2,599 buy-it-now or make offer located in Gaylord, MI. Is it me, or does this thing need a ski in the front and a v8 swamp rig to push it?! Or is it awaiting a starring role in some Disney-esque slapstick scenes of it coming loose and watching it careen down a mountain over/through all kinds of things from the family dining at the ski lodge outdoor picnic table to the mandatory run through the slalom course in the middle of the world cups to the usual over the top of the building and across pond only to end up in a pile of snow in the parking lot with the rumpled occupant emerging with nothing more than the frizzed out hair some wild expression on their face and a face plant as they try to walk, only to have the large dog lick their face?! What would you do with this thing? Exactly what I was thinking. Thanks for saving me all that messy searching and posting stuff. I don't know about a v-8 but defiantly needs the skis moved up front and some way to steer it... And maybe a 2000 artic cat, thunder at 1000 engine and rear suspension tacked onto the back of it. It's intended for towing behind that Arctic Cat, so it's probably well-insulated and somewhat too heavy to consider hanging under some sort of glider wing. Personally, I'd put it at the top of the mainmast of my 140-foot ketch as a sort of crows' nest. If I had a 140-foot ketch. It's also not all that aerodynamic, and would probably need a lot of structural reinforcement to carry one of the 35mm Oerlikon Gatling cannons, so I probably wouldn't use it as a ball turret on my 757. If I had a 757. I was thinking you could make your own Eagle from Space: 1999. Send it to Disney. They can use it as some sort of futuristic transport in the Star Wars movie. +1 on the Space 1999 reference. I would attach it to my millennium falcon. Is it just me, or does it look like some sort of giant weird Guy Fieri / Black Stig is staring at me from the other side of this thing? Yup. I kind of expect it to come right through the window at me! Sorry bout the double posting. I'm not sure why its doing it. So I'm uncertain how to stop it.